Eco-Alianza de Loreto’s mission is to protect and conserve the natural and cultural environment by empowering civil society and government to jointly create healthy and prosperous communities. Photos courtesy of Richard Jackson Photography. 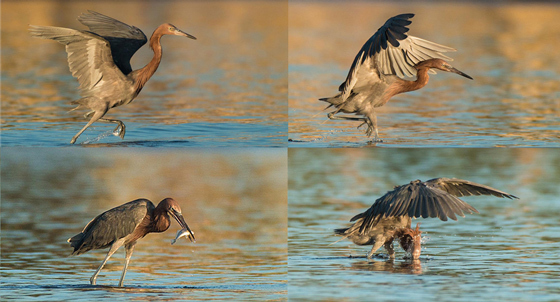 This photographic series by Rick Jackson proves how the proper tools and the proper technique make for an effective combination, as this Reddish Egret successfully catches breakfast (clockwise from upper left). Summer heat in Loreto demands efficiency in movement!! Photo courtesy of ProNatura Noroeste. Hugo Quintero (third from right at front table) took part in the La Paz presentation. Paralelo 28 collaboration. 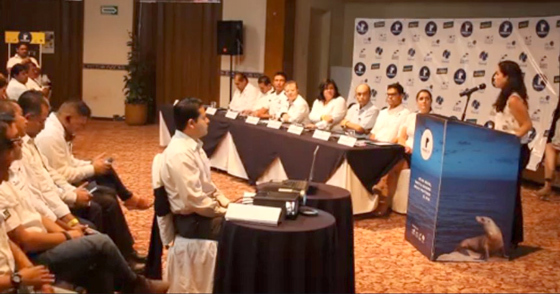 Late last month, Eco-Alianza President Hugo Quintero joined in a public presentation in La Paz, where representatives of tourism companies presented a check to support the collaborative efforts. Funds are raised through a variety of methods, including sales of wristbands, stuffed animals, events, and general donations to Paralelo28.org . In addition to Eco-Alianza, participating organizations include ProNatura Noroeste, Niparajá, and Red de Observadores Ciudadanos La Paz. The groups seek to partner with businesses, tourism service suppliers, tourists, fishermen and society in general, in the defense and safeguard of protected natural areas. 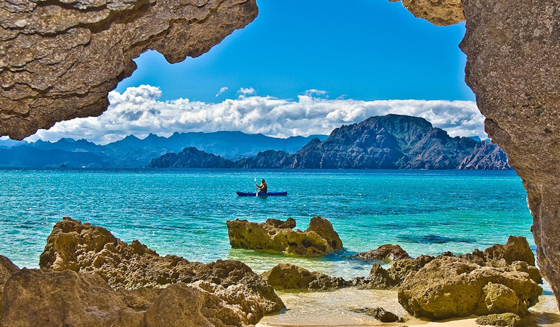 Funds raised will be dedicated to support surveillance and enforcement efforts in five natural protected areas in the region, including the Bay of Loreto National Park. Quintero said he hopes to host a similar Paralelo 28 presentation in Loreto in the late summer or fall. For more information: Paralelo28.org . Whether it’s an educational event, a workshop, a field trip, a public presentation, or some sort of teacher meeting or training, there’s always environmental education activity afoot at Eco-Alianza. At the center of it all is Environmental Education Coordinator Edna Peralta.Getting children and adults outside to experience nature is her favorite part of the job, Edna says, because helping people learn and helping them to make that personal connection is what it’s all about. After more than seven years building the environmental education program at Eco-Alianza, she is hopeful that she may be joined in the not too distant future by another educator. 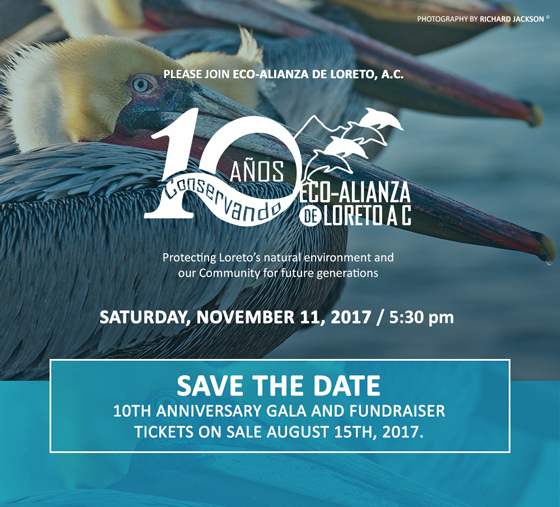 Come join us and kick up your heels on November 11 to celebrate Eco-Alianza’s 10 Years of Conservation. Our anniversary dinner/auction has sold out five years in a row, so with limited seating for our hallmark 10th Anniversary we’re expecting to sell out very early. Please reserve your tickets now to guarantee your seats. Photo of CenCoMA showing solar panels. Photo courtesy of Richard Jackson Photography. 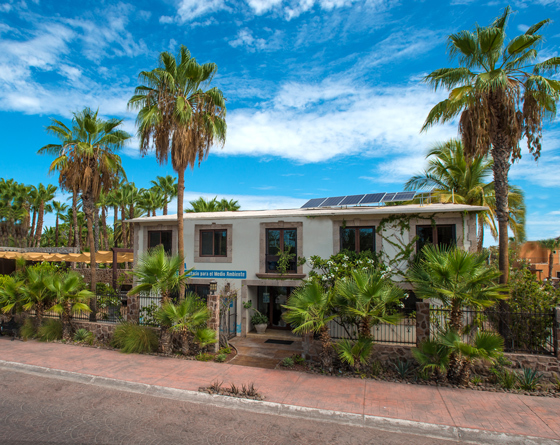 They’ve been in the plans for some time, but the array of solar panels on the roof of Eco-Alianza’s CenCoMA headquarters is an obvious sign of the organization’s long-term energy efficiency effort. Energy-efficient lighting, modular air conditioning units, outdoor plantings, and a shade-covered courtyard also have contributed to improved energy efficiency. Hugo Quintero, Eco-Alianza CEO and co-founder, said the nine solar panels and accompanying microinverters are just the beginning. Additional panels will be added over the next year or so, coordinated with other building improvements, to maximize energy production. Each panel is tilted at the perfect angle to take full advantage of sunlight throughout the year. Clockwise order from upper left. Brown Booby adult with single remaining chick. Brewsteri subspecies pair of Brown Boobies at a nest site. Photos courtesy of Tom Haglund/BCS Birds. If you’ve been missing seeing the Boobies the past few months there’s good news: they are returning from their annual nesting grounds to Loreto in good numbers. They leave in spring and go to several islands to nest. The Brown Booby (Sula leucogaster) usually lays two eggs. The Blue-footed Booby (Sula nebouxii) lays one to three. Both parents bring food to their chicks and regurgitate it for their consumption. Neither species typically raises all of its chicks successfully. Both birds dive for fish, the Blue-footed generally from higher than the Brown and very vertically to gain greater depth. The Brown flies lower over the water and dives at a shallower angle, returning to the air very quickly after most dives, whereas the Blue-footed often stays submerged for several seconds. The Blue-footed tends to fish in larger groups than does the Brown. 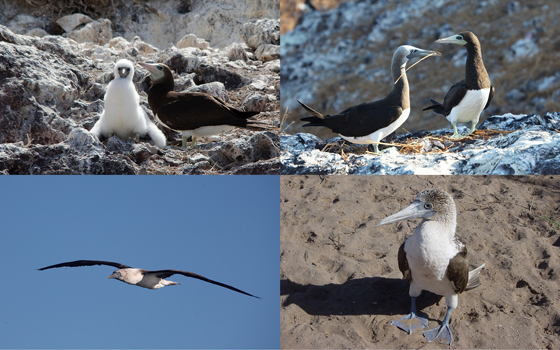 There is a subspecies of Brown Booby (brewsteri) here, the male of which has a whitish head, the females of both types of Browns look exactly alike. The Blue-footed, as the name implies, has blue feet. Both Browns and Blue-footed can be seen regularly in fall and winter in various locations around Loreto. On the Eastern and Northern cliffs of Isla Coronado they can be quite numerous. The remaining pilings of the old pier on the north side of Las Garzas often has a number of roosting Blue-footeds. Both species can be seen diving for food all along the malecón and beaches. Early last summer, we embarked on a quest to inform more fully, and to interact more frequently, with everyone interested in Eco-Alianza’s mission. The initiative included Soundings – a new, monthly e-newsletter. 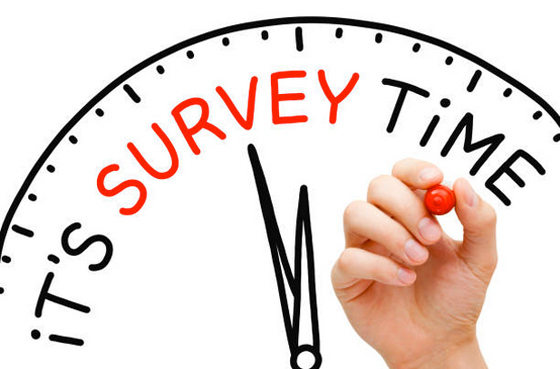 Last month we began a 10-question Readers Survey, which ends a week from today. Please take two minutes to share your thoughts about Soundings‘ first year, and you may find yourself the lucky winner of an Eco-Alianza cap or T-shirt – our way of saying thanks for your time and your opinions!! 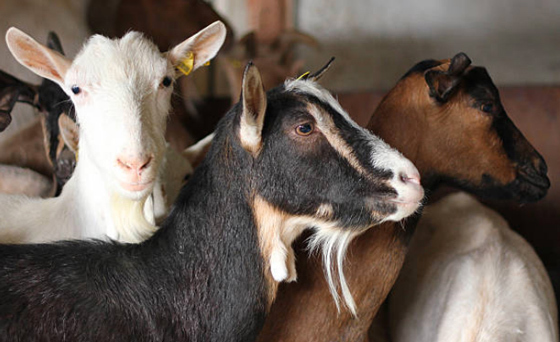 Loreto’s Own Organic, Pasteurized Goat Milk and Cheese Operation Expecting November Opening!!! Photos by Megan Rogers and Eco-Alianza staff. 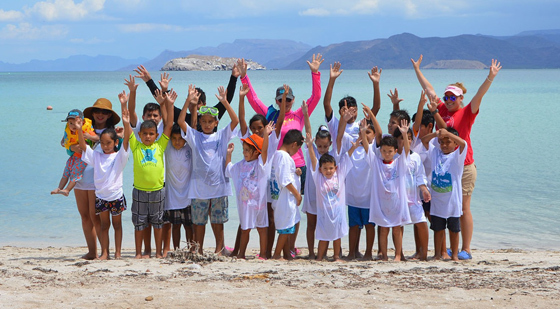 More than 50 volunteers rolled up their sleeves on July 14 at the Santispac beach on Bahía Concepción in Mulegé, determined to do whatever is necessary to support a critically endangered fish, the Totoaba. On that day, the task was to release 30,000 young fish into the bay, a bucketful at a time. When the 244 islands and islets of the Gulf of California were declared a World Heritage Site in 2005, the Totoaba was one of the reasons – an endemic, endangered species that historically has been an important food source in the area. Currently it is also the center of controversy, as illegal fishing operations target the species and sell it covertly to a black market in China that covets only part of the fish, its swim bladder. The gill nets that are used to catch Totoaba in its range in the northern Gulf also are blamed for the precipitous decline of the world’s most endangered cetacean, the Vaquita (see article below). As Totoaba have become rarer and rarer, the Mexican government has taken a variety of steps to conserve both the Totoaba and the Vaquita. One of the efforts for the Totoaba involves a privately-owned company called Earth Ocean Farms in La Paz, which operates a hatchery for the fish and raises them through aquaculture until they are large enough to have a fair chance for survival. 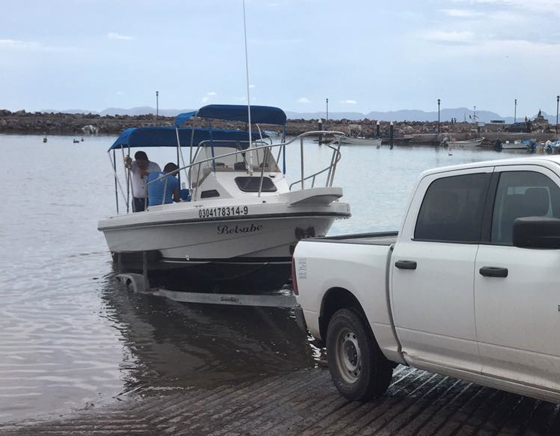 This is the third year that Eco-Alianza has taken part in the fish release, sanctioned by México’s secretariat in charge of fisheries, Sagarpa, as well as Semarnat. Part of the reasoning for the release site is that it’s an area within the natural range of the Totoaba, but is nearly 400 miles south of the range of the Vaquita. Although the program has a bit of a wait-and-see, experimental element to it, helping an endangered species in any way is a positive step, says Eco-Alianza President and CEO Hugo Quintero. “Even if all the Totoaba babies released are eaten by larger fish, events like these not only aim to help the ecosystems, but to change the mind-set of all the participating people, engaging them in conservation and in a responsible consumption of seafood products.” Releasing the animals, he says, “brings hope to young kids and helps them feel both connected to nature, and part of a potential conservation solution.” This year, he said, several special needs children from Santa Rosalía took part, giving them a rare opportunity for a hands-on conservation experience. Amidst a diverse crowd of passionate adults, my camera lens gravitated most towards the glowing faces of the children at the Totoabas release. Though I come from a dramatically different climate and culture, I could relate to the excitement of the children in full, recalling my own Salmon release experience when I was their age. The physical impact of the Totoabas release will remain largely ambiguous, as the fish were not tagged in any way; however, the greatest impact of the release could be in the memories made by children. It is experiences like the Totoabas release that cultivate the next generation of environmentally connected and conscious citizens. Witnessing the joy of the children as they liberated the precious fish gave me immense hope that as they grow into teens and parents one day, environmental awareness will be a part of their identity. Photo courtesy of Center for Biological Diversity. Earlier this month, the annual meeting of the UNESCO World Heritage Committee, in Krakow, Poland, resulted in some unexpected results for many involved in the struggle to save the Vaquita, the world’s most endangered cetacean. The small porpoise, which lives in the northern Gulf of California and nowhere else, has dwindled over the past decades from an estimated population of almost 600 in the late 1990s to 245 in 2008; 200 in 2012; 97 in 2014, 60 in 2015; and now 30. The marine mammals’ main cause of mortality has been entanglement and subsequent drowning in fishing nets, many aimed at another endangered species, the Totoaba fish (see article above). In a 1972 convention the United Nations created the World Heritage Committee to identify and designate specific sites around the world that contain elements of Outstanding Universal Value (OUV), including threatened animals and plants, unique physical or biological formations, and other natural features. The Islands and Protected Areas of the Gulf of California were declared a World Heritage Site in 2005, partly because of the endangered Vaquita and the endangered Totoaba. As a signatory of the World Heritage treaty, it is incumbent upon the Mexican government to conserve and protect the 244 islands and islets that are part of the site, and also the elements of OUV. Part of the World Heritage convention declares that sites can be declared at the annual meetings as “World Heritage Site in Danger,” a designation that allows for other countries to take extreme measures, and use UNESCO funding, to protect the OUV elements of the site. If the site loses its OUV elements, it also allows for de-certification as a World Heritage Site. Since May 2015, the Center for Biological Diversity and the Animal Welfare Institute have lobbied for the UNESCO World Heritage Committee to apply “In Danger” designation for The Islands and Protected Areas of the Gulf of California site, including all five islands in the Bay of Loreto National Park. This year the resolution was widely expected to pass, at the annual meeting in Poland. Part of the argument is that México’s government has not taken adequate measures to protect the Vaquita and Totoaba. The petition paper is linked below. Surprisingly, however, less than two weeks before the meeting, México announced that the temporary gill net ban in the upper Gulf, where the Vaquita live, has been made permanent. The committee at its meeting voted to delay for a year the decision to attach “In Danger” designation to the site. 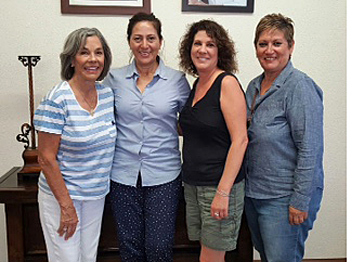 Linda Kinninger, Arely Arce, Caryl Cantrell, Rosa Campos. Eco-Alianza staff photo. Loreto’s Sister City Committee has held several meetings this spring and summer to investigate ways to work cooperatively with a similar committee in our Sister City of Ventura, CA. Among other topics, the group is considering a variety of fundraising ideas to support cross-cultural trips for exceptional Loreto children to visit Ventura and participate in an exchange program focused on environmental education. The trips would also have cultural components, as well as informal opportunities to experience life with American families. The Sister City Committee in Ventura, as reported previously in Soundings, is considering ideas for a “Migrant Club” project that would benefit Loreto. The group’s Migrant Club was initiated earlier this year by 10 Mexican nationals who now live in the Ventura area. Formation of the group may make them eligible for matching funds from the Mexican government for projects that benefit sister communities in México (i.e., Loreto). Currently, both groups are investigating the feasibility of initiating a used motor oil collection facility for Loreto, which could ultimately result in used motor oil being recycled. The municipality of Loreto is helping to explore the idea, which would require approval of an appropriate site, as well as a variety of environmental and other permits. On the plus side, the facility would ensure that used motor oil is collected in an appropriate manner, instead of potentially being disposed of in ways that could leach into drinking water aquifers or the marine park. Watch this space for more news on this project and other Sister City/Sister Park/Sister Mission happenings. Eco-Alianza staff photo.At the beginning of July, Eco-Alianza welcomed a new staff member, Jimena Gallegos Palos, who will serve as Projects Manager. Jimena earned a degree in Electronic and Telecommunications Engineering from the Autonomous University of San Luis Potosí, her home state in North-Central México. 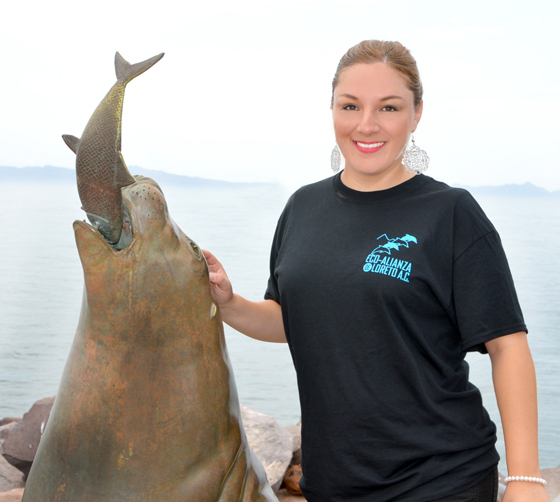 She is currently studying for a master’s degree in Environmental Management and Marine Technologies. Jimena also has a strong interest in Eco-Alianza’s budding business incubator initiative and holds a degree in Social Incubators from the Cuernavaca campus of the Monterrey Institute of Technology and Higher Education. She has previously worked to link México’s national entrepreneurial support system to business acceleration platforms and a private capital management network, all to benefit budding entrepreneurs. Eco-Alianza staff members came to know Jimena through her work in La Paz on various StartUp Weekend events, supporting local entrepreneurs and helping to flesh out their ideas (previously reported in Soundings). If you’ve stopped by Eco-Alianza recently, you may have noticed the friendly smiles and diligent work habits of our two summer interns, who both head back north late this month. Alex McBratney (17), from Santa Ana, California, attends Troy High School. 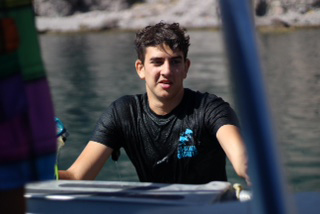 Alex is the third member of his family to intern at Eco-Alianza. 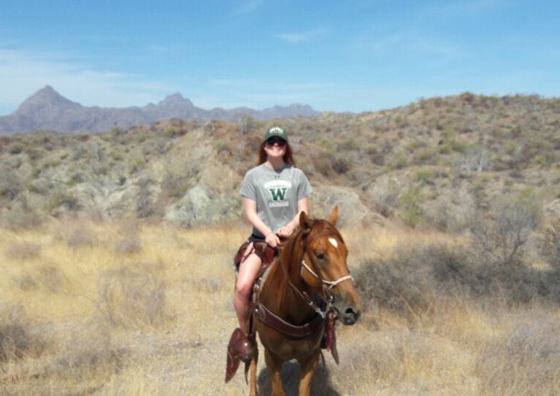 His sisters Kelly and Katie enjoyed the experience so much, it inspired Alex to spend a month working at Eco-Alianza and exploring the diversity of Loreto. Alex has been working along with Hector Trinidad, Director of Eco-Alianza’s conservation programs and Loreto Coastkeeper, and Edna Peralta, Coordinator, Environmental Education Programs. 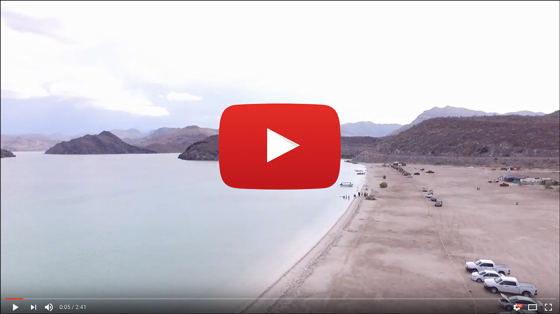 Alex says he was struck by the natural beauty of Loreto, which helped him understand why Eco-Alianza’s staff works so hard to protect it. Working on the Coastkeeper program with Hector, Alex says, also showed him the support that the community has for conservation and nature. We’ll miss Megan and Alex as they head back to finish up high school, and we expect we haven’t see the last of them! Wilson’s Plover, already an adept crab catcher at a few days out of the egg. Yellow-Crowned Night Heron, crab specialist with a crushing bill for the job. Little Blue Heron, won’t turn blue for months, but has the crab thing figured out. Ring-billed Gull, take ’em or leave ’em, yummy when ya can get ’em. 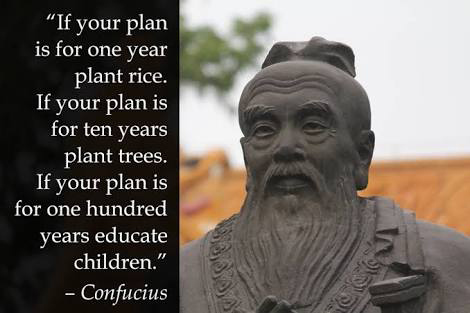 As we approach Loreto’s rainy season it might be a good time to reflect a minute on what that means. The countryside will explode in greenery and butterflies, of course, but some of the other big benefits are more subtle. Vast amounts of new soil and nutrients will course down from the mountains through the arroyos and pump new life into the esteros (estuaries) all along the Baja coastline. Here in Loreto, that means Estero las Garzas will receive its share of life’s basics to continue producing protein on an enormous scale. A walk along the beach around Las Garzas is an easy lesson in this amazing cycle, as we will see literally millions of holes, many surrounded by some tiny mud balls. These are mostly the homes of crabs. Various sizes of several species make up this incredible scramble of food looking for food. They are in the middle between their diet of even smaller life forms and the much larger shorebirds who harvest them. Some birds are crab specialists, others just take them when convenient. Wilson’s Plovers eat little else and live their entire lives on a couple of miles of Baja shoreline. 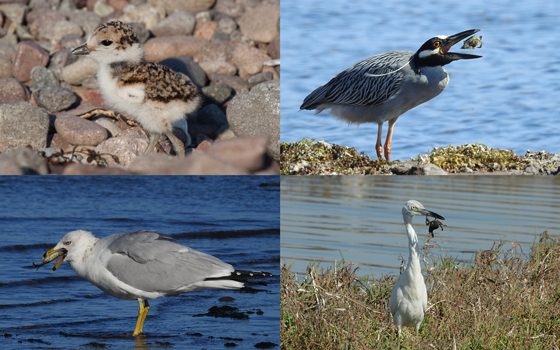 Yellow-crowned Night Herons also take crabs almost exclusively, whereas the Little Blue Heron, and Ring-billed Gull are opportunistic crab eaters. Obviously, these vital coastal interactive zones between land and sea are impacted by whatever comes down those arroyos. Be it a grand summer rain or some introduced runoff, they cannot dodge the flow. Soundings is One Year Old – Take the Survey! A little over a year ago, we embarked on a quest to inform more fully, and to interact more frequently, with everyone interested in Eco-Alianza’s mission. This initiative has included website upgrades, the beginnings of the Loreto.com website, frequent postings on social media, and Soundings – our monthly e-newsletter. So what do you think? We’d appreciate two minutes out of your busy day to help us make Soundings even better. Take our 10-question readers survey, and you may find yourself the lucky winner of an Eco-Alianza cap or T-shirt – our way of saying thanks for your time and your opinions!! At Eco-Alianza, our CenCoMA headquarters is already abuzz with talk about November’s 10th Anniversary dinner/auction gala. The hallmark event promises to be the best ever, even topping last year’s elegant soiree in the newly refurbished courtyard. To make the event extra special, we need your help. One of the highlights of the event is always the live auction, which not only raises critical funds for Eco-Alianza programs and initiatives, but offers up some pretty amazing items and experiences. For our 10th Anniversary, we really need the WOW factor, and that’s where you come in! Photo courtesy of Richard Jackson Photography.The vast majority of NGOs either burn out or fizzle in their first decade, so this really is a momentous occasion. Do you have an item, or a unique experience, that could be auctioned off to help the cause?? A lot of our bidders are doers, and aren’t always attracted by “stuff,” so we’re especially looking for out-of-the-ordinary outings or passes or tag-alongs or special trips with a unique flair! Our silent auction needs items and experiences, as well, so now’s the time, as we begin putting together our auction catalog. All donations are tax-deductible in the U.S., so if you can pitch in, or just want to discuss an idea, please email Edna Peralta at Edna.Peralta@ecoalianzaloreto.net . And thank you so much for your support – we’ll see you November 11. Most of us remember the first time we saw a blue whale, probably the largest animal ever to roam the planet. Their elegant grace almost belies description, and it’s easy to forget for a moment their massive size as one listens to their breathing or watches their tail slip beneath the waves. 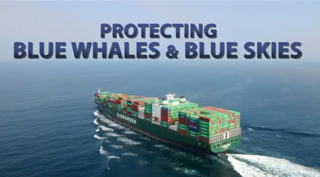 Slower container ships means safer whales. Photos courtesy of Earth Media Laboratory. Shipping lanes bisect the Santa Barbara Channel. Unfortunately, their tremendous size translates into an inability to turn on a dime, or to get out of the way of passing ships – which becomes a huge problem when blue whales cross shipping lanes. But just as we’re in love with blue whales here in their southern sanctuary of the Bay of Loreto National Park, cetacean enthusiasts in our Sister City of Ventura, and neighboring Santa Barbara, are taking steps to protect the whales on their migration route. As it turns out, shipping companies can have a heart, too, especially when compassion is coupled with an improved bottom line. The video linked below explains the win-win situation that is now in play. 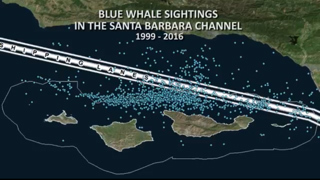 Shipping companies are slowing their vessels as they traverse the Santa Barbara Channel, resulting in fewer problems for the whales, improved fuel efficiency for the ships, and also far less air pollution. Proving again that cooperation often beats confrontation, and it never hurts to ask. Enjoy! Copyright © 2017 Eco-Alianza de Loreto, A.C. All rights reserved.